Seven of Cups (R) says you are experiencing worry, anxiety and fear – feeling timid, insecure and defensive. Allow yourself to experience your emotions – KNOW what you really want. Look at your deepest desires and recognize which goal has enough meaning and power to sustain you – then focus all your energy on it. Focusing on all of your desires and allowing them to break your attention will eventually tear you apart. Experience your determination to create something from your dreams and do something with them. An unexpected event will take place now – it will be beneficial and improve your attitude, for it will be a definite change for the better. Believe and always trust that you are on the right track – continue to pursue your goal without wasting time, for success is yours in time. Watch for any glimmer of success and follow it through – never give up your ideas – even when it is hard to carry them through. Ignore any opposition – offer your insecurity up in prayer and it will be replaced with spiritual strength. Persist in studying and you will reap great rewards. A lack of emotional resources in spite of good efforts. A poor emotional harvest resulting from personal error or natural disaster. A shortage of energy and emotional awareness of your next step. A delay or block with a new emotional cycle. Problems, difficulties of emotional greed or an overly strong sexual appetite. Escaping into fantasy, emotional confusion, difficulty in choosing or defining your emotional path. Envy of another’s relationships, not satisfied with what you have or coveting another’s partner. Immaturity in emotional or creative matters, the lack of proper emotional or sexual experiences resulting in disrespect in emotional affairs. In the first position: You are certainly ready for this archetype as your principal card of karmic purpose, otherwise you would not be given it. Nevertheless, as when one’s intention is to walk on hot coals, one must remain focused and disciplined and all will go well. In the second position: Your resources are only as reliable as the energy you have had to sustain them and you may end up having to rob Peter to pay Paul. Every facet of your life may seem to be in motion. As long as you can keep juggling, nothing will fall. In the third position: Get ready, things may get a little bumpy for there are many things coming across your path that you have little experience with. Some are right for you, others are not, so pick with care. The rest of the reading will help you prepare. In the fourth position: The passion here is a rejection of the fuller experience of emotions, which at its extreme might resemble the Victorian attitude. In the fifth position: What an appetite! The problem may be that you have many plans rather than a plan. You may just be spinning mental wheels. In the sixth position: At one extreme too many things, inner and outer will vie for your attention. Much of it is undesirable confusion. In such a period of sensory overload, it is best when unsure of any offer, to turn it down. There are no opportunities offered in such a climate that you cannot live without. At the other extreme, there will be a dearth of harvest and/or opportunity. This too will pass and do not accept or force any situations out of boredom or impatience. 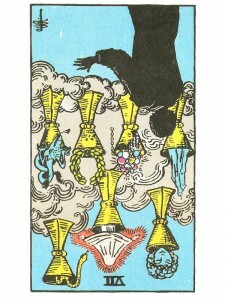 In the seventh position: There can be too much or too little creativity flowing and caution should be exercised. In the eighth position: Life may feel a little bit like a grade B hollywood movie. Most of these opportunities are not for you. But take notes, it will make interesting reading in your autobiography, that you had these chances and turned them down. In the ninth position: Check the motivations here, for what is appropriate should be good for the emotional package at hand, for you and your extended family – not for just you alone. Your heart may be confused with unexpected and possibly mysterious opportunities. In the tenth position: This reinvestment in your emotional/creative future will be made more difficult by either of the extremes – too may choices or too few choices. Be patient and do not throw the baby out with the bath water.